Since the temple was first established by Emperor Kameyama，three Fires have destroyed the original buildings. (late 16th C.) The present buildings were constructed after the Momoyama period. 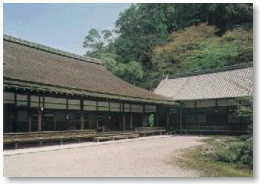 When you enter through the typical Zen gate，turn to the left and you will see the long，Wide terrace of the main hall. From there you can see the simple and profound Zen garden which beautifully combines space and rocks. 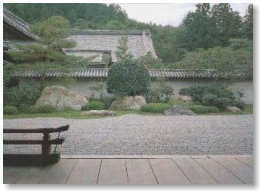 Because of the shape of one of these rocks，this garden is sometimes called“Leaping Tiger Garden”. It was made by Kobori Enshu in the First period of Edo. The main building is a national treasure. This building called Seiryo−Den，Which was once built at Kyoto Emperor Palace. In 1611 it was brought to Nanzen-ji. The architectural style is traditionally Japanese. The pictures on the sliding doors are the masterpieces of Kano Motonobu and Kano Eitoku.